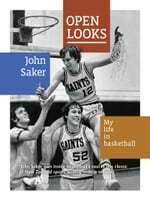 John Saker was NZ's first professional basketball player. In the 1970s he spent two years on a scholarship in the US, and then played in France for three exciting seasons. He represented New Zealand as a Tall Black from 1975 to 1987 and captained the '84 team. Wine writer for Cuisine and The Sunday Star-Times, John Saker is the author of How to Drink a Glass of Wine (Awa Press), Vinacular - A Wine Lover's A-Z (Awa Press) and Pinot Noir: The New Zealand Story (Random House).